The Joan Brown Estate was established by the artist’s family in 1990, and strives to create a wider audience for her artwork. It is also committed to preserving her legacy by collaborating on exhibitions and publications, and encouraging placement of Brown’s work in the collections of public institutions. While the bulk of Joan Brown’s archives are housed in San Francisco, and a smaller collection in the University Archives at UC Berkeley, the Estate hopes to facilitate greater research and education of the artist’s work by making archival resources accessible online. It welcomes inquiries from students, museums, researchers, and educators who are interested in the artist’s work, life, and archives. Joan Brown, Self Portrait at Age 42, 1980, oil enamel on canvas, 71 3/4 x 60 inches, © The Joan Brown Estate. The selection of images presented here highlights Joan Brown’s extensive investigation of the Self. Through these works, which span the duration of her career, reoccurring imagery of the artist’s home, studio, and beloved city merge with her longtime interests in animals, art and religion of other cultures, her passion for travel, and her changing relationships. Over time, the lines between these interests began to blur, creating hybrid figures and scenes that cross between reality and the imagined, the mundane and the spiritual. Shifting concerns in paint handling, composition, and tonal contrasts are also evident throughout her oeuvre. The Joan Brown Estate takes part in ongoing research to provide a public look into the artist’s personal and professional archives in order to situate the artist in the history of art from the 1950s to the 1990s. Please check back regularly for new and updated information. Joan Brown’s unprecedented success at a young age put her work into a national spotlight soon after she graduated from the California School of Fine Arts (now SFAI) in San Francisco, in the 1960s. Over thirty years, Brown’s work changed radically, turning from the influence of abstract expressionism and Bay Area figurative art, to an aesthetic that was uniquely her own. 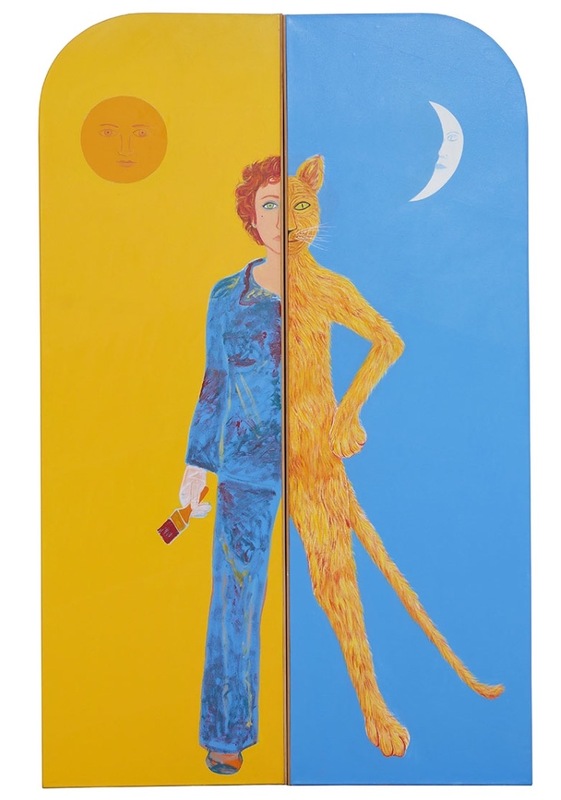 Joan Brown’s work is distinctive in its autobiographical nature. Her work is simultaneously personal, absurd, comic, fantastical, and arresting—all traits that were integral qualities of Brown’s character. Profoundly influenced by her own teachers and mentors–in particular, artists Elmer Bischoff, Nathan Oliveira and Frank Lobdell–Brown herself taught at UC Berkeley from 1973 until her death in 1990, going on to shape a new generation of painters in the Bay Area. Joan Brown, Summer Solstice, 1982. oil on enamel, 88 x 59 inches, © The Joan Brown Estate.